Eugenius!, the most eagerly anticipated new musical for years, is coming to London in January 2018 with a strictly limited run at The Other Palace. 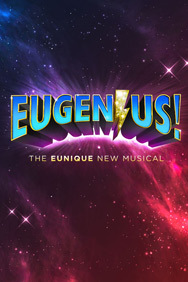 Through underground word-of-mouth, and a very public concert performance – selling out the London Palladium – Eugenius! is fast becoming a cult phenomenon. The show is a teenage love story set against a backdrop of comic books and superheroes. Eugenius! boasts a totally originally score – Ben Adams’ homage to all the great sounds of the '80s – plus a scintillating script that makes you laugh, cry, and punch the air shouting #GoEugenius! This is a show where geeks rule, dreams come true, and everyone finds the superhero inside themselves – you’ve just gotta know where to look. Click here to pay in Pounds.